Dry to moist. Disturbed sites, roadsides, pastures. White petals when present, otherwise green sepals. This is a 8″ to 20″ tall, erect, annual or biennial forb that rises on usually a single stem from a slender, branching taproot. At first it forms a rosette about 6″ in diameter of basal leaves. The basal leaves are 1½″ to 2¾″ long and either coarsely toothed or untoothed and once lobed. When the plant is a biennial it overwinters in this form. 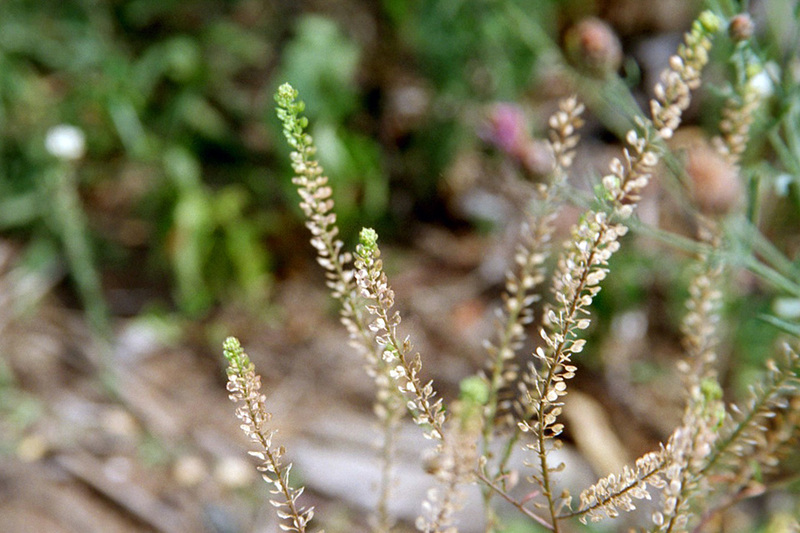 Basal leaves are usually wilted by flowering time. 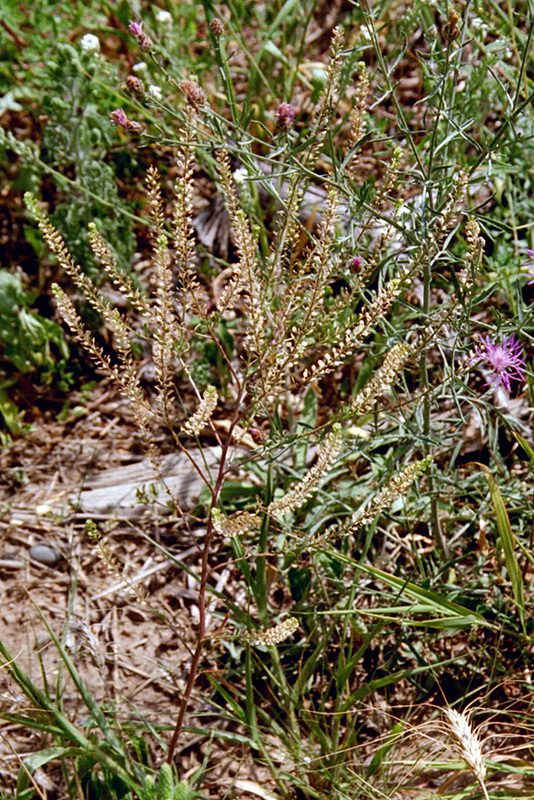 The flowering stems are erect or ascending. They are occasionally branched at the base, often branched in the upper third. They are covered with minute, straight, spreading hairs. Lower stem leaves are similar to the basal leaves, alternate, narrowly inversely egg-shaped or linear, 1″ to 3⅛″ long, and less than ⅜″ wide. They are on short leaf stalks and are sometimes lobed but are usually unlobed. The leaf blades are tapered at the base and taper to a point at the tip with straight sides along the tip. The upper surface is hairless. The lower surface is usually hairless, sometimes sparsely minutely hairy. The margins are usually untoothed. Upper stem leaves are similar but smaller, linear, and stalkless but not clasping. The inflorescence is a dense, unbranched cluster (raceme) at the end of the stems and branches. The racemes are compact when in flower, but quickly elongate as the fruits develop, eventually becoming up to 4″ long. 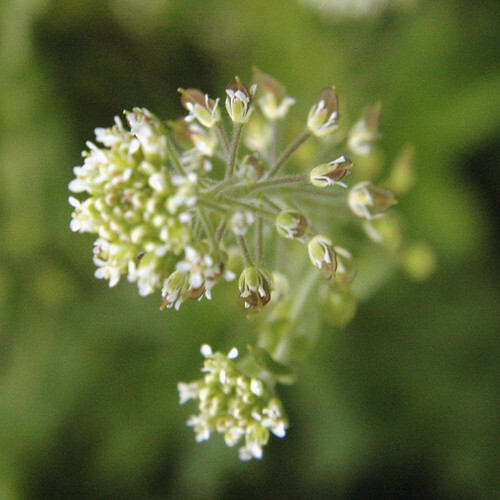 Typically, a few flowers are in bloom crowded at the top of the raceme, with developing and developed fruits below. The individual flowers less than ⅛″ wide. There are 4 green, linear to narrowly elliptic sepals, and either 4 white petals or no petals at all. When petals are present they are no longer than the sepals. There is no floral scent. The fruit is a flattened, 1 ⁄16″ to ⅛″ long, broadly egg-shaped, seed pod. It is widest above the middle. The tip is narrowly winged and has a broad, shallow notch. It is initially green, turning brownish when dry. It is on a stalk that is spreading or ascending. 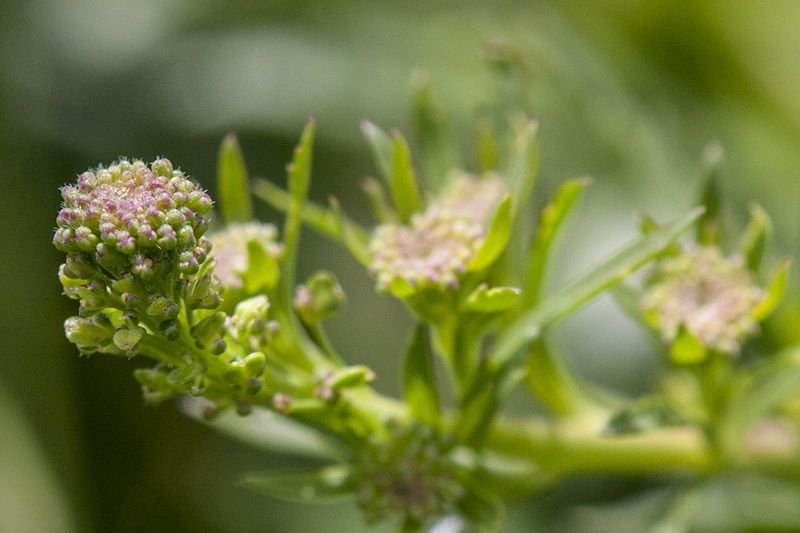 Bigseed pepperweed (Lepidium densiflorum var. macrocarpum) has larger fruits. Clasping pepper grass (Lepidium perfoliatum) upper stem leaves are broadly egg-shaped to circular and perfoliate or strongly clasping with auricles that surround the stem and overlap. 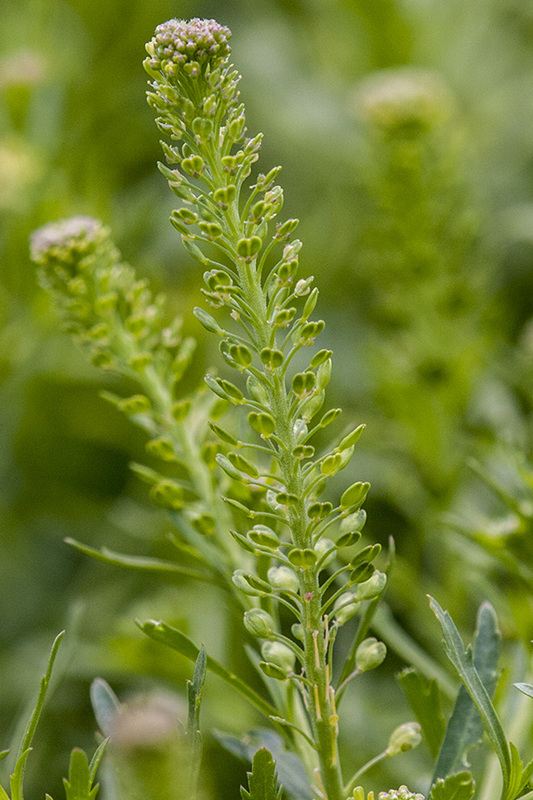 Field pennycress (Thlaspi arvense) fruits are much larger, 5 ⁄16″ to ¾″ long, and are broadly winged all around, not just at the tip. Gardencress pepperweed (Lepidium sativum) fruits are on stalks that are closely ascending or almost erect. The fruits are larger, 3 ⁄16″ to ¼″ wide. 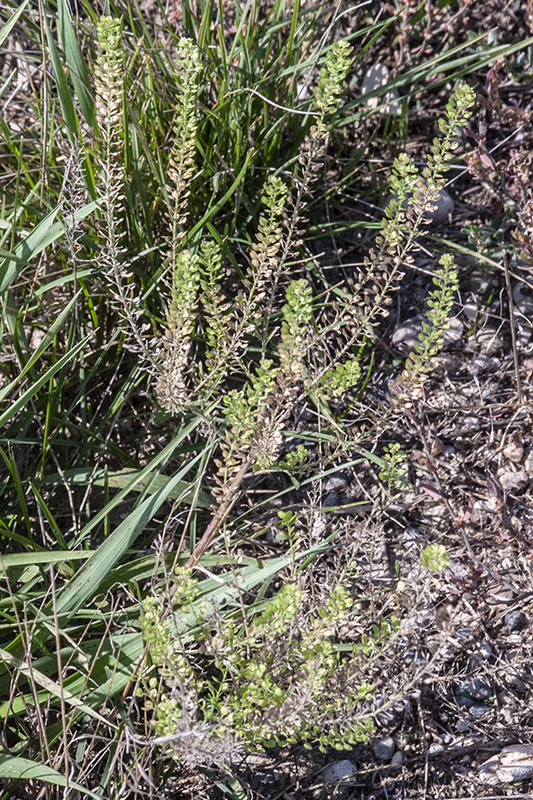 Virginia pepper grass(Lepidium virginicum var. virginicum) is nearly indistinguishable when not in flower. The flowers always have petals. The petals are as long to twice as long as the sepals. The fruits are mostly round, widest at the middle. A small, ear-like projection at the base of a leaf or at the junction of a grass blade and stem.